Drawings and a pen list and a calamity. | Inkdependence! 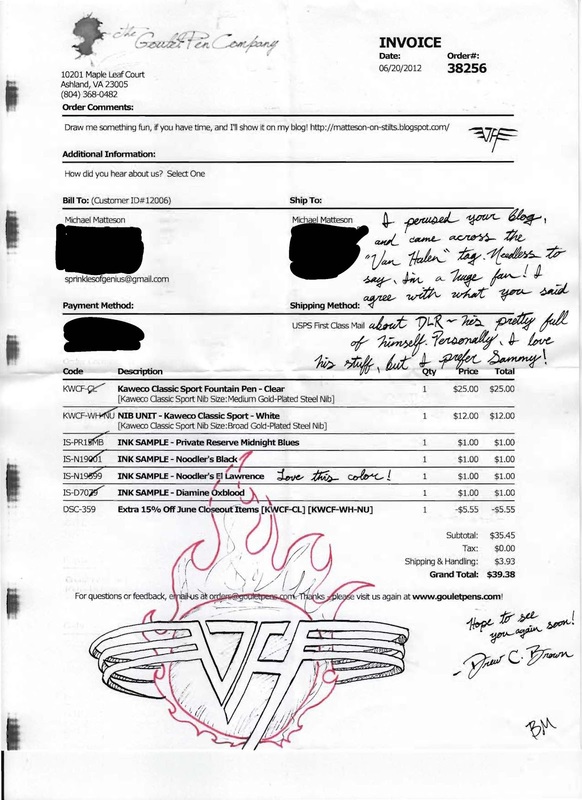 A while back on the FPN, there was a thread where people showed the drawings that the folks who send out Goulet's orders sometimes draw in invoices. I thought that would be neat, so I asked for a drawing on my last order. Drew totally drew me something. I may have mentioned in the past that I need a list to keep track of the pens/inks that I'm currently using. My list was messy last time, so I wrote a new one today. Here it is, if you're curious as to what I'm using right now. That green splotch at mid-right is the remnant of some ink that soaked through from a near-catastrophe. My red Ahab has been having problems with its plunger system. The threads that are supposed to secure the converter to the section just don't do the job. I don't know if they're cut too shallow, or what, but that converter just won't stay there. I actually switched the converter that was originally in there for the one that was on my black Ahab because it seemed to catch the threads better. Anyway, today I was writing out this list and the red pen was acting like it was running out of the awesome Hunter Green ink I keep in there. So, I unscrewed the body to check the ink level in the converter. Apparently, the converter had come loose from the section while the pen was sitting in my pen case. This was unexpected. Ink kinda went all over my hands and it would have gone all over my butcher block desktop if I hadn't had that pad and some other things on the desk. Then I put the body of the pen down on that pad while I looked for somewhere to put the inky section and breather tube and what not. Of course, the converter of very bulletproof green ink was still in the dang body and it started to run all over that top page. Ugh. I'm glad I was able to contain the mess, but I lost some of that ink (not a lot though, I suppose) and my hands are bit green-streaked, and I can't trust that pen/converter at all. I guess I'll have to make that pen into an eye-dropper even though I didn't really want to. It's opaque, and I'll never know how much ink is in there. Well, live and learn. I don't think I'll be buying any more Noodler's pens for a long while after the issues I've had with them.